Before chef David Chang exploded onto the food scene, Momofuku was a humble ramen bar serving up fresh noodles and "to die for" pork fat in the confines of a single counter space. My first trip to Momofuku, Mr. David Chang himself was serving up the noodles, cooking the spicy chicken wings, and poaching those melt in your mouth soft eggs - it was love at first sight. I remember thinking what a great concept! 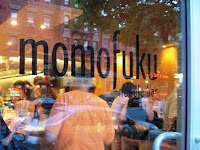 And I remember the enthusiasm of the chef as he and his staff discussed expansion ideas - hint...there may be a Momofuku coming to Las Vegas in the near future...an idea that has been floating around since 2005. My favorite dishes are the smoked chicken wings and the pork buns....as for the ramen, after ordering a couple appetizers, one soup might be enough to share with your partner. Also, be prepared for a bit of a wait- but now that it has moved up the street into a larger space the wait is more manageable than before.